We are strict at products quality and are skilled in international trading to make our clients comfortable to import assorted goods. 1.Q:Are you a factory or trading company9 A: We are a company which is a combination of production and trade,include industry and trade integration business. 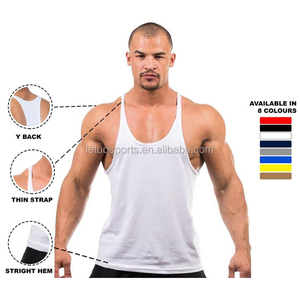 If you have any questions about Custom cotton tank top sleeveless men gym hoodie fitness muscle bodybuilding tank top vest hoodie clothing Feel free to contact me. Men's Gym Plain Striped Hoodie shirt Hooded Pullover Casual Top There are total 600 styles available,please feel free to contact us to get newest E-catalog and price list for your selection. Customized order is also available,please feel free to let us know your designs,then we will make some mock up and samples before mass production. 3. Payment and safety transaction We accept alibaba trade assurance to ensure on-time shipment and pre-shipment product quality. Gym clothing striped raw cut dropped armhole mens bodybuilding tank top small quantity clothing manufacturer More Details of Gym clothing striped raw cut dropped armhole mens bodybuilding tank top small quantity clothing manufacturer Features : 1) Soft and suitabe fabric make you comfortable when do sport 2) special design bring different felling. 3) Tight-knit version of fabric gives incredible support 4) Can be customization totally as your own design 5) You can add your own logo/ customize your prefered color/fabric Materials : Cotton &Polyester( Customized fabric available ) Designed For : Sportswear / Gym / Run Supply Type : OEM ( Customized ) MOQ : 50 PCS per design in per color FOB price : US $1.89- $6.68/ piece Sample : Can customize new sample as your requirement SampleTime : 5-7 work days ( normally ) BulkProductionTime : 20-25 work days ( based on Qty ) Packaging & Shipping Looking forward to doing business with you! 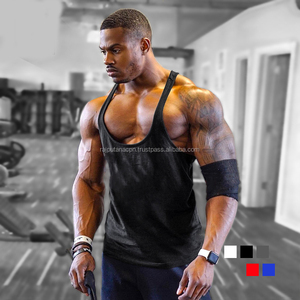 multi-color bodybuilding clothing wholesale for men,comfortable fit,good workmanship from strictly controlled productionline. about us yoozze clothing ltd is a knitwear manufacturer based on nanchang, china. Alibaba.com offers 7,066 bodybuilding clothing products. About 30% of these are fitness & yoga wear, 21% are men's undershirts, and 14% are men's t-shirts. A wide variety of bodybuilding clothing options are available to you, such as breathable, anti-bacterial. You can also choose from spandex / cotton, polyester / cotton, and 100% polyester. As well as from men, unisex. And whether bodybuilding clothing is free samples, or paid samples. There are 7,091 bodybuilding clothing suppliers, mainly located in Asia. The top supplying countries are China (Mainland), Pakistan, and Bangladesh, which supply 82%, 16%, and 1% of bodybuilding clothing respectively. Bodybuilding clothing products are most popular in North America, Western Europe, and South America. You can ensure product safety by selecting from certified suppliers, including 590 with Other, 256 with ISO9001, and 198 with BSCI certification.